Product prices and availability are accurate as of 2019-04-15 01:35:15 EDT and are subject to change. Any price and availability information displayed on http://www.amazon.com/ at the time of purchase will apply to the purchase of this product. 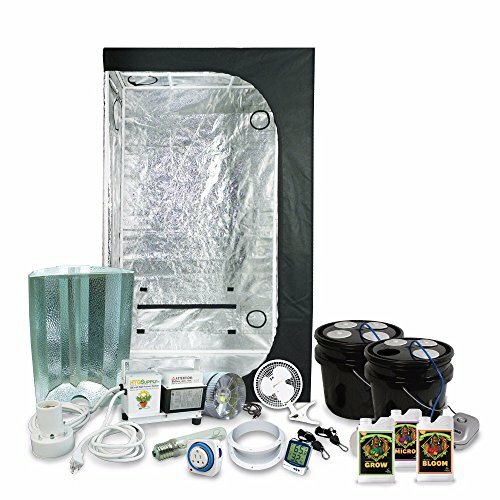 The 250 Watt Small Bubble Boy complete grow kit includes everything needed to get a successful hydroponic garden growing in no time! HTG Supply is proud to have served the needs of growers nationwide for over a decade now! We know, through years of working with and listening to our customers, that trying to piece together the right indoor garden with all of the options available can be time consuming and frustrating so we've answered the call by developing our line of complete, "plug & play" grow tent kits. All of the top-quality equipment and products included in HTG Supply complete grow tent packages are properly sized and selected to work in harmony and produce a full harvest. Only HTG Supply can offer an incredible deal like this - so take all of the guesswork out of getting set up, and start enjoying your garden in no time with your HTG Supply complete grow tent kit! Now with pH Perfect fertilizer technology from Advanced Nutrients-no pH adjusting needed! Kit assembles quickly and easily - no tools required. All included electronic devices plug directly into standard household grounded power outlets. All items are shipped in plain discrete packaging.